The true events depicted in We Were Soldiers make it a very different Vietnam movie from such fictional accounts as Apocalypse Now. Based on the book 'We Were Soldiers Once . . . And Young' by Lt Col Harold G. Moore and Joseph L. Galloway about the first major battle in the Ia Drang Valley in 1965, the film is a gruesome depiction of the bloody engagement in which 400 American troops, under the leadership of Moore, took on 2000 North Vietnamese. The other way in which the film differs from almost all other Vietnam movies is that it makes no attempt to address the political aspects of the war. It has no agenda and instead focuses on the soldiers, never questioning why they are there. The purpose of this approach, according to the book's authors, was to differentiate the soldiers from the war. This was presumably done in order to elevate their deeds above the perceived futility of Vietnam. While it may have achieved that, the film's wholesale carnage only reinforces the pointlessness of war. The brutally graphic opening scenes of Saving Private Ryan set a new benchmark in war films, one that We Were Soldiers has raised to yet greater heights of goriness. The close-up battle scenes are not for the squeamish, particularly the images of napalm victims, but for all the effectiveness of Dean Semler's cinematography, in the end We Were Soldiers is repetitious and wearying. 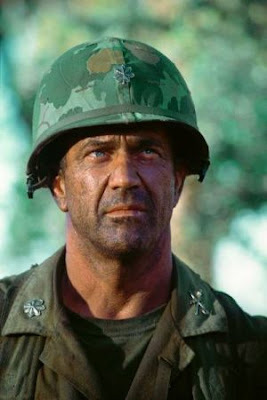 Mel Gibson is the tough and compassionate Moore, but even with his convincing portrayal, it's hard to believe he's playing a real person and not just another of his archetypal heroic roles. Director Randall Wallace was also responsible for the screenplay adaptation of the book. With past writing credits including Braveheart and Pearl Harbor, he has an ear for sappy dialogue, a talent that is evidenced here with lines like, "I'm glad I could die for my country" and "Tell my wife I love her". Whenever reality meets Hollywood, there are inevitably some concessions. It would be nice to think that Hal Moore had the type of blissful marriage and idyllic family life portrayed here, but authenticity is questioned when Madeline Stowe, who plays Moore's wife, exhibits the radical lip augmentation army housewives only dreamed of in 1965.